I love everything about that video – the tenaciousness of the little truck, the fact we’re watching it from the windscreen of a JA Jimny, that “天下無敵四駆軽トラですね!” in the description translates as “‎Invincible 4WD truck, isn’t it? 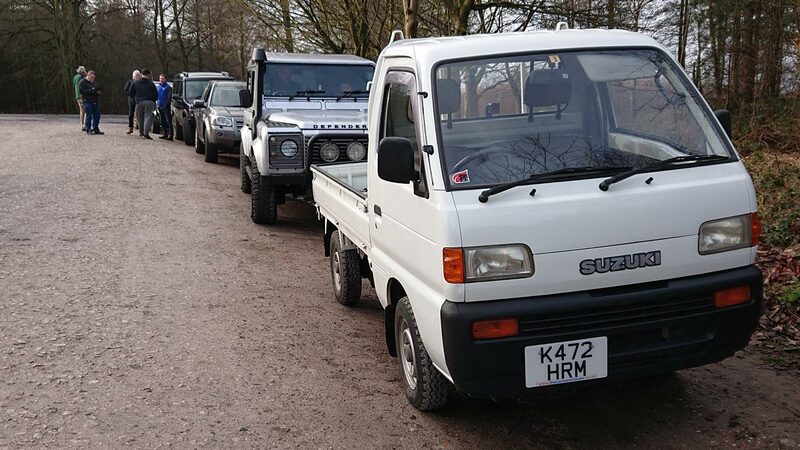 !‎” – but I also feel a pang of jealousy for the freedom the Japanese seem to have when it comes to taking their 4WD vehicles into the countryside. Snow-laden single track roads, forestry tracks, scraps of land turned into miniature off-road parks – we’re certainly not as lucky in this country. I’d been hoping for some serious snow over winter as one way to test out the Carry’s 4WD system – those types of adventure are always fun(!) – but unfortunately we got very little. I’d also thought about taking on the tamest possible tracks at a local “pay and play” site but ultimately those places are a bit too extreme for a vehicle like the Carry and would’ve probably required me to leave my mechanical sympathy at the entrance gate… no thanks! 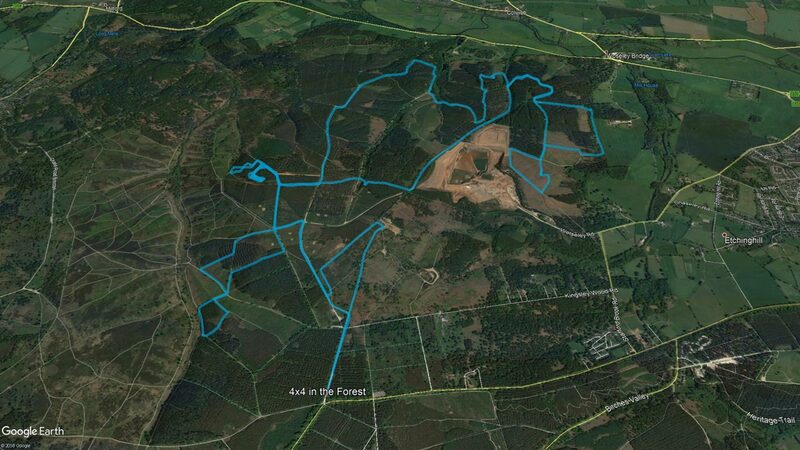 Scoping around for other opportunities I came across the 4×4 in the Forest events at Cannock Chase – less than an hour away from me – which sounded like the perfect way to re-enact my Japanese forestry track dreams here in the UK. I booked online for the March event, then realised that it might be best to check if the Carry would actually be suitable. 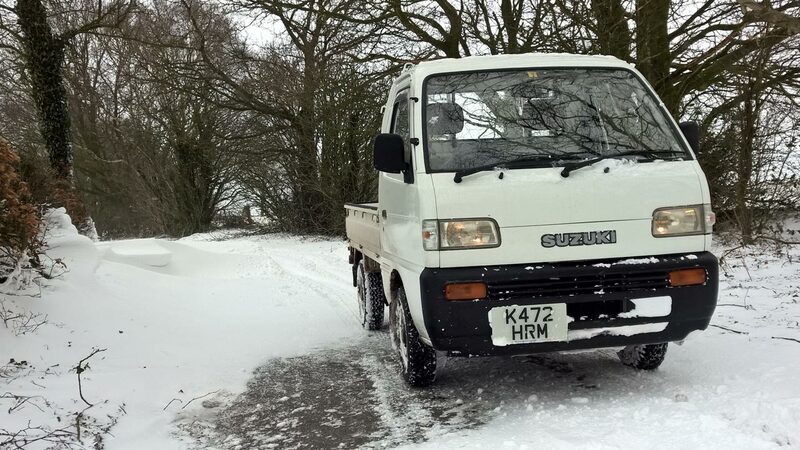 I needn’t have worried – in a quick e-mail exchange before the big day the Forestry Commission ranger said he was more than happy to see what the little truck could do, his one recommendation being to add a bit of ballast in the bed to aid traction. 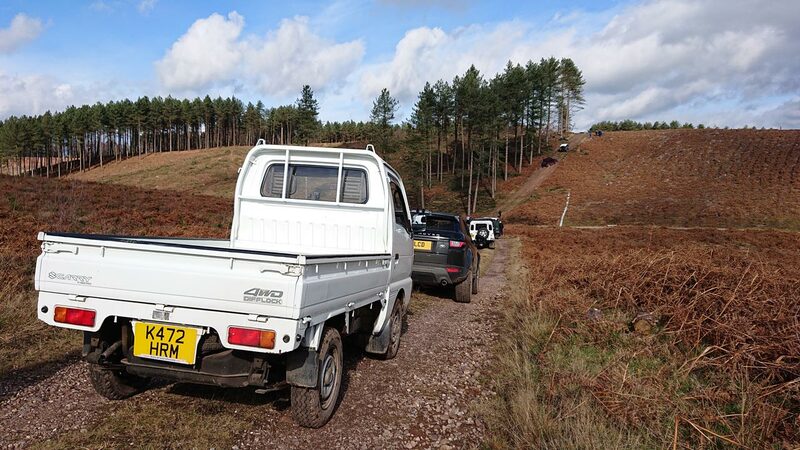 On the day the 16-strong convoy – made up of various Land & Range Rovers, two Hiluxes, an Isuzu Trooper, a Mahindra, and the Carry – motored 15 miles around the Chase over 3 1/2 hours, tackling steep climbs and descents, technical twisting paths, and muddy water holes, with just enough forestry track in between to give us all a breather before the next tricky section (and allow us to admire some beautiful countryside along the way). It was immense fun and the Carry held its own throughout, going everywhere the more serious machinery went including a particularly steep climb that was causing grief for some of the bigger trucks. Tiny ground clearance, limited rear traction and a relative novice at the wheel also made every bit of the route feel massively tricky and thus hugely rewarding to get through, so much so that my wife and I have secretly crowned it Champion of the Chase, an equal to the Legend of Longnor in every respect. I’d thoroughly recommend the day to anyone interested in taking their 4×4 off-road, either for the first time or if they’re looking to get a better understanding of what their vehicle is capable of. Don’t shy away if it’s standard either – the Carry (and my aunty’s Evoque) proved that you can have bags of fun in a totally stock 4WD. The atmosphere was very relaxed, everyone involved was super-friendly, and photographs of the event were shared afterwards via a dedicated Facebook group – what a neat bonus!